My internet connection has returned to life, but Loretta's remains buried beneath snow and fallen trees. I'll be carrying on in her stead until she digs out - we hope sooner rather than later! "Location, location, location" is the mantra of every real estate agent when it comes to judging the value of a property. Historic houses are no different, with fate and fortune playing their part, too. 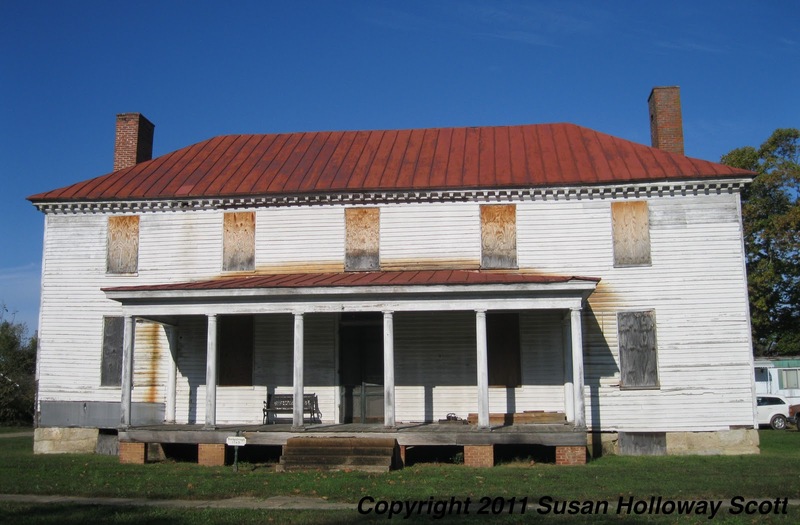 This house, above left, sits forlornly in Port Royal, VA, and is known as the Brockenbrough-Peyton House. Today Port Royal is little more than a tiny, sleepy village (I've written about it before here), but when it was founded in the 17th c, its location on the banks of the Rappahannock River made it an important center for the export of tobacco to England. Port Royal's taverns, warehouses, and churches, an academy and a Masonic Lodge were thriving when this house was built around 1760. The earliest known owner was Champe Brokenbrough, who passed the house to his daughter, a Mrs. Peyton. At the time of the Civil War, the house was shared by her children: her son, Randolph Peyton, and his two unmarried sisters, Sarah Jane and Lucy. 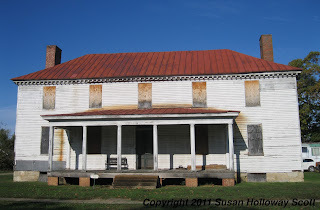 But despite so much history, the Brockenbrough-Peyton House has suffered greatly. Not only have the lands and gardens that must have once surrounded it vanished, but in the mid-20th c, the house's elegant interior was gutted and the woodwork sold (it's now in the Nelson-Atkins Art Gallery in Kansas City, MO.) Today it sits with boarded windows and blue building tarp tied to its back, bravely waiting for the huge amount of money necessary to restore it. I can't help but think of another house that has fared much more happily. Belonging to distant cousin (and similarly named) Peyton Randolph, the house, right, was built at nearly the same time in the 18th c and in a similar style, and was also funded by tobacco-money. But the Peyton Randolph House was built in Williamsburg, where it became part of Colonial Williamsburg with its future secured by Rockefeller money, while less than a hudred miles away, the Brockenbrough-Peyton House languishes in Port Royal. 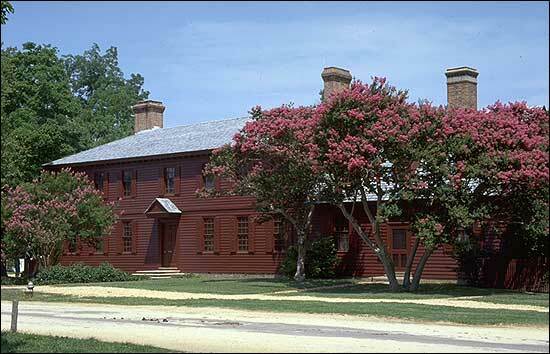 Right: Peyton Randolph House, Williamsburg, Va. Photo courtesy of Colonial Williamsburg Foundation. Port Royal is one of my favorite, still fairly undiscovered, towns. Thank you for the post. Thanks so much for sharing this little-known national gem. I'm usually nodding off by the time I reach Port Royal on my trek from Lynchburg, VA to Solomon's Island, MD when I always take notice of Port Royal. I love the chimney stacks and this sad but still-beautiful house. Not only those two items, but a bit further up US 301 are a couple of fantastic old churches. Driving that route always makes me appreciate our history - and then I fall back asleep on 301. All the best to Loretta and hoping that the weather disaster can get sorted out soon. I'm afraid this Brit only ever thinks of one thing hearing the name Peyton, and that's Peyton Manning. Reckon he's good to be touched for a cash injection to the place? 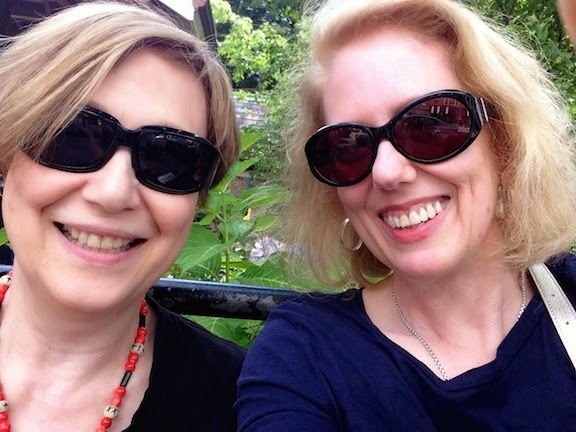 I so envy your LOCATION, LOCATION, LOCATION and access to Colonial Williamsburg. I have a big SouthWest credit due to my canceled New Orleans trip (I should be there now, *sob). Maybe if I get my 18th century day dress done I’ll make a trip out there. Click on Booth Tour Pictures.